ArcadeLift is the PUP that uses misleading techniques to prevent removal. Use Reimage to locate malicious components and get rid of them faster than with uninstall instructions. A full system scan blocks virus reappearance and prevents traffic to malicious domains. ArcadeLift is an adware that displays intrusive online ads, initiates redirects and might spy on the users. This potentially unwanted program (PUP) usually travels in software bundles and attacks inattentive users’ computers. Apart from game-themed ads, the ArcadeLift virus might also use a virtual layer to deliver ads promoting various third-party content. This PUP might offer to download questionable system tools, update software or accept shopping discounts. However, we highly recommend staying away from such content because it may lead to potentially dangerous websites. Ads delivered by ad-supported applications are extremely dangerous. They usually are misleading and might be the part of a huge malvertising campaign. Thus, when you click this ad, you might directly install malware executable or end up on a scam site. 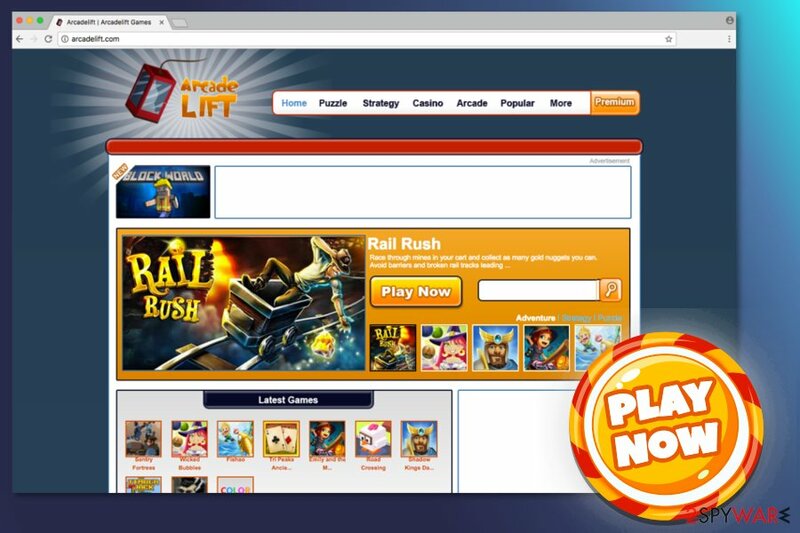 Once you notice an increased amount of ads offering to play puzzle, strategy or casino games, you should not hesitate and scan the computer with Reimage or another anti-spyware. It helps to remove ArcadeLift from the device and forget about annoying activities about adware. However, the adware that is responsible for bringing ArcadeLift ads to your browser might have different interests. This PUP might not only tracking browsing-related data but also install third-party tracking tools that are trying to steal sensitive information about users. Data tracking is a big issue nowadays, and users are encouraged to pay attention to their online security. Therefore, installation of suspicious and annoying application should not be tolerated. Keep in mind that ArcadeLift removal is necessary for protecting both – your computer and personal privacy. Thus, it should not be postponed. ArcadeLift virus works as an adware program that floods web browsers with commercial content. Authors of ArcadeLift use a popular software marketing method – bundling. Using this technique, they add the PUP as an optional component in freeware or shareware packages. Thus, it can easily travel along with various applications. When users download a necessary program, they are offered to choose between Quick or Advanced settings. If they agree to install software under quick setup, they give indirect permission to install all additional downloads. Thus, in this way, the ArcadeLift hijack might occur as well. The PUP widely spreads among the United States and the United Kingdom. Thus, users from these countries should pay more attention to software installation. You can remove ArcadeLift ads manually or automatically. Keep in mind that installing ad-blocking program is not the option. Adware usually can bypass such programs and continue to bother your regular browsing sessions. In order to get rid of aggressive gaming ads, you need to find adware and delete it from the system. You can follow manual elimination guidelines below and investigate the system with the help of it. If you want to speed up ArcadeLift removal, you should opt for the automatic elimination option. This method suggests scanning the computer with an updated anti-malware. The adware might have arrived on the system together with recently installed software. Thus, you need to check the list of installed programs and uninstall suspicious entries. Here, look for ArcadeLift or any other recently installed suspicious programs. Wait until you see Applications folder and look for ArcadeLift or any other suspicious programs on it. Now right click on every of such entries and select Move to Trash. In order to get rid of ArcadeLift pop-ups, you need to follow the instructions below. They will explain how to remove adware-related components from the Internet Explorer. When in the new window, check Delete personal settings and select Reset again to complete ArcadeLift removal. By following the steps below, you need to reset Microsoft Edge after the hijack. Once these steps are finished, ArcadeLift should be removed from your Microsoft Edge browser. Go to the Mozilla's extensions and uninstall unknown entries. Then reset the browser in order to get rid of tracking cookies installed by ArcadeLift adware. Here, select ArcadeLift and other questionable plugins. Click Remove to delete these entries. Now you will see Reset Firefox to its default state message with Reset Firefox button. Click this button for several times and complete ArcadeLift removal. ArcadeLift may have arrived as a Chrome extension. Thus, follow the steps to get rid of unwanted entries. Here, select ArcadeLift and other malicious plugins and select trash icon to delete these entries. Click Reset to confirm this action and complete ArcadeLift removal. Here, select Extensions and look for ArcadeLift or other suspicious entries. Click on the Uninstall button to get rid each of them. Now you will see a detailed dialog window filled with reset options. All of those options are usually checked, but you can specify which of them you want to reset. Click the Reset button to complete ArcadeLift removal process. ^ Noah Gamer. Ads on websites are dangerous to more than your sanity. Trend Micro Blog. Security News, Views and Opinions. ^ Amul Kalia. Here’s How to Protect Your Privacy From Your Internet Service Provider. Electronic Frontier Foundation. Defending your rights in the digital world. ^ NoVirus. NoVirus. British site about recent cyber threats. This entry was posted on 2017-07-11 at 05:27 and is filed under Adware, Viruses. You can quickly scan the QR code with your mobile device and have ArcadeLift ads manual removal instructions right in your pocket. 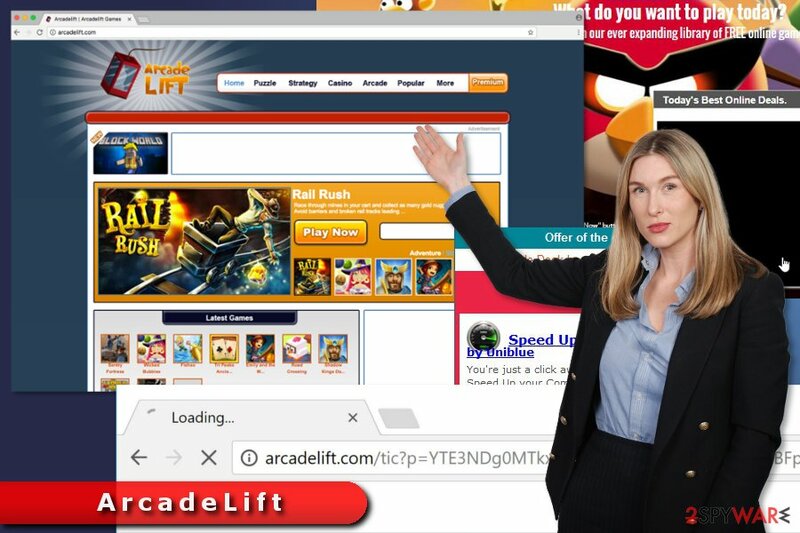 How did you remove ArcadeLift ads?